Taste test: These are decent vinegar chips. A medium-strength vinegar kick on otherwise ordinary potato chips. More vinegary than salty. Smell test: Mild, nice vinegar aroma. 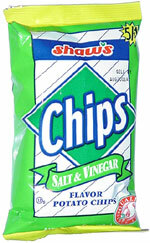 Trivia: At 20 cents a bag, these chips were quite a good deal. 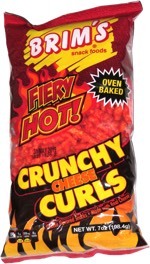 This snack was discovered by Jeremy at Star Market (formerly Shaws, and Star Market again before that), Porter Square, Cambridge, Massachusetts.